The cost of a Thanksgiving dinner in 2017 fell slightly from last year, according to the American Farm Bureau Federation’s 32nd annual price survey of classic items found on the Thanksgiving Day dinner table which indicates that the average cost of this year’s feast for 10 is $49.12, a 75-cent decrease from last year’s average of $49.87. Consumers continue to see lower retail turkey prices due to continued large inventory in cold storage, which is up almost double digits from last year, Newton explained. Items that increased modestly in price were: a half-pint of whipping cream, $2.08; a 14-ounce package of cubed bread stuffing, $2.81; a 30-ounce can of pumpkin pie mix, $3.21; a 12-ounce bag of fresh cranberries, $2.43; and a 1-pound veggie tray, $.74. 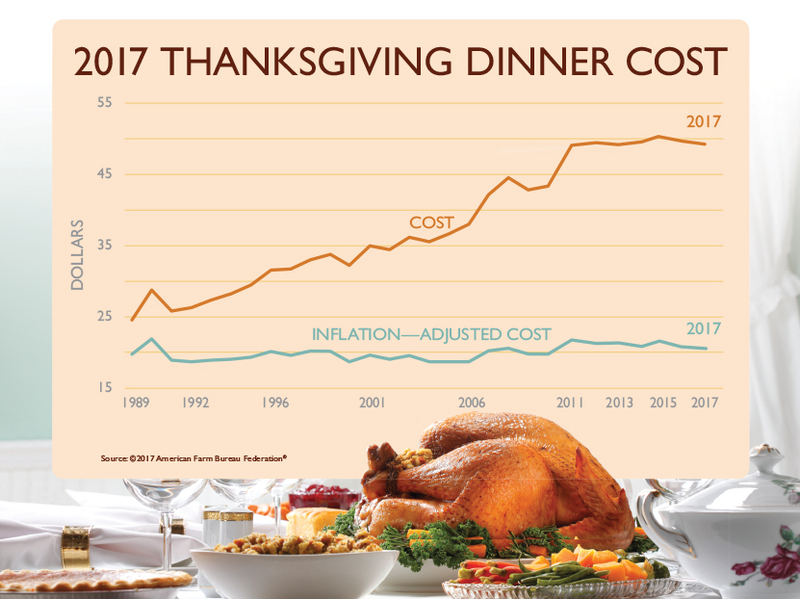 After adjusting for inflation, the cost of a Thanksgiving dinner is $20.54, the lowest level since 2013.